Utterly delicious cashew milk, with a creamy texture and richness to replicate cow’s milk. The secret is a long soak to soften the nuts for smooth blending. Homemade cashew milk is richer, creamier and has a stronger flavour than shop-bought cartons. The secret to creating a superior home version lies in taking the time to thoroughly soak the nuts (see my article on How to make the creamiest Nut Milk). Cashews that have been soaked overnight become saturated and soft. This means that they grind into smaller particles, which blend more effectively into the water. The result is that less nut meal gets left behind during the straining process, creating a thicker, creamier texture, and a stronger flavour. The other advantage to making your own cashew milk is that it is free from preservatives, thickeners and emulsifiers, which can aggravate a sensitive gut. Thickeners like tapioca starch are added to commercial nut milks to mimic the viscosity of cow’s milk, while emulsifiers are added to stop the solids from separating and sinking to the bottom. It is normal for nut milks to separate in the fridge – just give the bottle a vigorous shake before using. Shaking redistributes the solids, dispersing and suspending the fat particles in the water. After you have strained the milk, you will be left with a clump of wet nut meal. There’s no need to throw this away, as you can make use of it in other cooking projects. For example, the pulp can be used in baking recipes, where it can be added to batters for muffins, cookies and cakes. It can also be stirred into soups, stews and curries to act as a thickening agent, or sprinkled on top of baked dishes like crumbles, casseroles and meats to provide a textured crumb. Just remember that saturated meal will add liquid to the recipe, and take longer to brown. It will also weigh more than dry ground nuts, due to the water content, so you will need to increase the amount used if you are following a recipe. Due to the high water content, you should store wet meal in the fridge, and use within 2-3 days. Alternatively, you can dry out the pulp on a very low heat in the oven for several hours – about 3-4 hours at 80°C/175°F. As long as the meal has been completely dehydrated, it can be treated like any other dried product, and stored for several months in an airtight container. Alternatively, you can leave the nut pulp in, and enjoy the thicker texture of unstrained nut milk. Because cashews soften so much after soaking, they blend into smaller particles than harder nuts like almonds. This creates a very smooth milk, and a more liquid pulp that can be difficult to scrape off the straining material. For this reason, I don’t generally bother straining cashew milk. If you also decide to dispense with straining, you will need to give the bottle a good shake before using, as the solids will settle on the bottom. Add salt to the soaking water – this helps activate the nuts so that the nutrients are digestible. Submerge the nuts completely – this ensures even saturation, and stops the wet nuts from going mouldy. Blend immediately after draining – if you leave the soaked nuts for too long they develop a sour taste. Soak the cashews. Place the cashews and salt in a bowl, and cover with a couple of inches of cold water. Cover with a lid, and leave to soak for 8 hours. Tip the cashews into a large sieve over the sink, discarding the soaking water. Briefly rinse under the cold tap. Grind the cashews. Combine the cashews with the water and blitz on high in a blender for about 2 minutes – or until the liquid stops jumping up the sides of the blender and churns around smoothly. You will probably need to do this in 2 batches. Strain the cashews (or not). You can enjoy the milk as it is, or you can strain out the ground nut pulp. Line the sieve with a piece of muslin and place on top of a pouring bowl or wide-rimmed jug. Tip in the blended cashews and water, and allow the liquid to drip through for a few minutes. Gather up the ends of the muslin and squeeze until all the liquid has been pressed out. 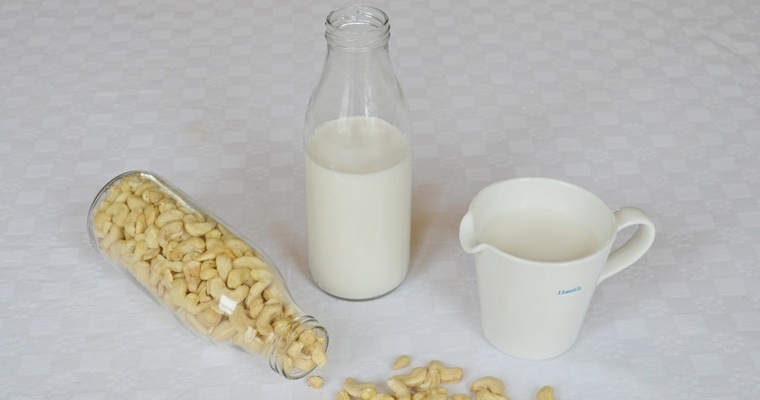 Transfer the cashew milk to an airtight container and keep in the refrigerator for up to 5 days.